Whether I'm working with students or teachers, I love to help people rediscover their passions, dream big and reach their potential. I started out in education teaching high school math. I spent 14 years in that job, even though I always felt out of place. A eight years ago I was asked to take an instructional tech position. I eventually discovered the power of project based learning and the importance of letting students make meaningful contributions. I also put more heart and soul into my own work by sharing my talents and my dreams. Now students share their dreams with me. We do exciting projects and I feel I'm adding something that's vital, yet so often neglected in the system. After two decades of working in education, I can say for certain I'm enjoying the best years of my career. 6 Ways to Teach Like an Artist - This is my post from 2013 that started it all. 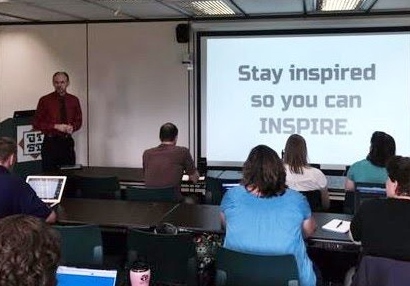 I've been doing a presentation at conferences called The Way of the Google Drive. It sums up a lot of my work. Click here to see a series of articles dedicated to "teaching, connecting and creating like never before". If you care to read more about my games, technology and my personal interests, see my About page from my Classroom Games and Tech blog.